May assist in the maintenance of cholesterol within the normal range in healthy people and improve LDL:HDL ratio. Blackmores Cholesterol Health provides a relevant dose of plant sterols to help maintain blood cholesterol within normal healthy range in healthy people. Cholesterol maintenance is an important part of many people's diet and lifestyle regimes. Research shows a daily dose of 2-3 grams of plant sterols from plant sterol-enriched food is required to help maintain healthy cholesterol levels. 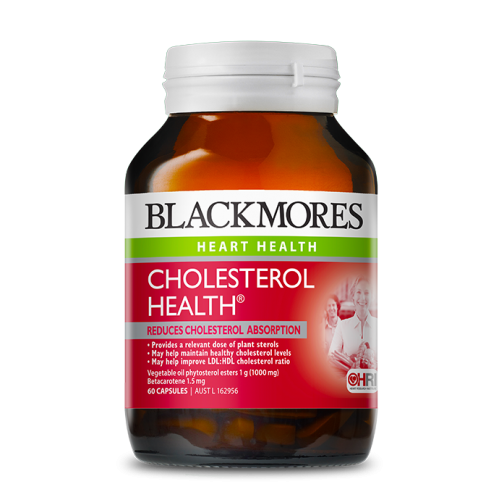 Blackmores Cholesterol Health provides a daily dose of 2 grams of plant sterols. It also contains betacarotene, as betacarotene absorption may be reduced when taking plant sterols.